Looking for a new home? Looking to remodel your current one? An important factor in evaluating cost and value of cabinetry cannot be determined by looking at the exterior alone. 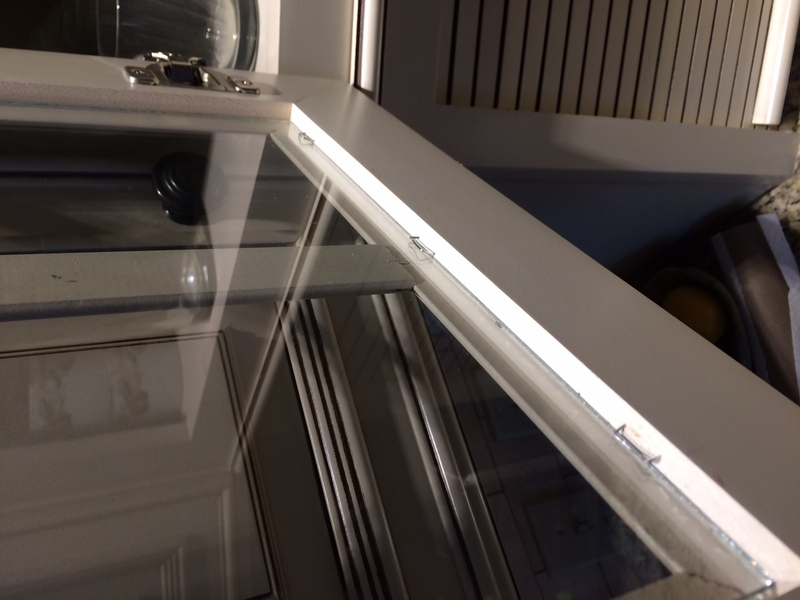 Using the example of Glass-Front Cabinetry, here’s what you shouldn’t see! Glass Front Cabinetry is an option that adds texture and interest to kitchen, bath and wet bar spaces and provides opportunity to showcase personal collections. It is visually very appealing in the overall design and look with its myriad of cabinetry styles, details and levels of glass obscurity. 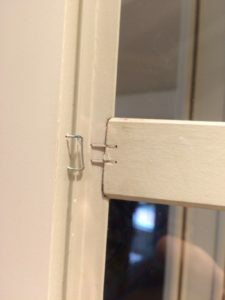 Well made products of this option should show that the glass panel is securely in place… held by metal adjustable clips, custom made screwed in frames, or sealed in place with silicone. What shouldn’t you see? Staples. Your hard working cabinets deserve a little more attention that the framed poster on your basement wall! So open up the door, see what you are considering investing in and make sure it is a quality product. 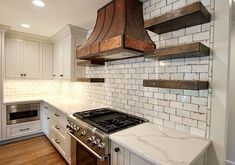 Big beautiful kitchen pictures are impressive… but they may not help a client decide who to hire when remodeling. What should you do when interviewing contractors? Ask who designed it. 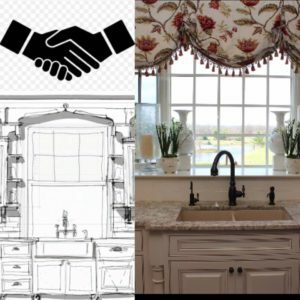 The person who knows EXACTLY what went in to that design, how layout problems were solved, what elements and materials were suggested, ideas that were discarded for specific reasons… THAT person can elaborate on every detail of what that beautiful kitchen picture really represents. 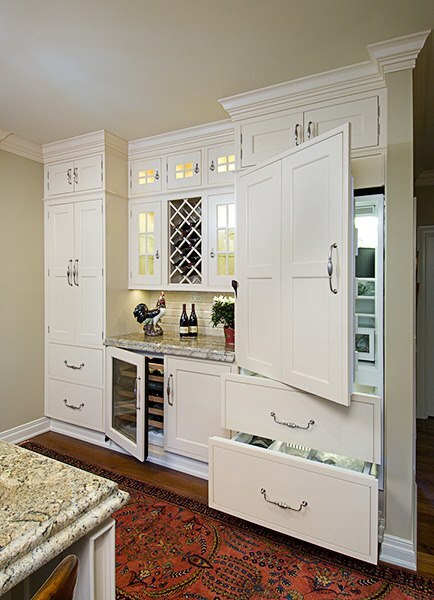 If you want that level of attention to your remodeling project, visit us in our showroom. We have a beautiful portfolio of AKB designed projects and can happily explain what went in to each and every one of them. 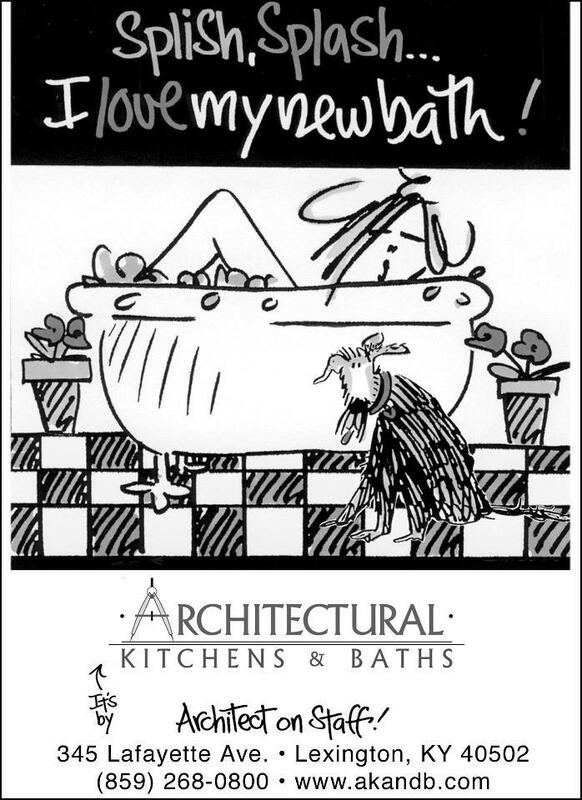 The best remodeling projects are the result of a collaborative relationship between a client and a designer. Discussing how you use your current space, why your current space does not work for you, what materials, finishes and features you have always dreamed about- make the perfect conversation points for the experienced designer with knowledge and resources to help you. At AKB, show us a photo saying you want a space just like it …and the first thing we’ll ask is “What do you like about this project?” Our projects are created by bringing all your ideas together to create a plan, a plan that is unique to you. We have an attractive showroom where many people drop by to discuss redoing their kitchen or baths. They enjoy looking through our vast array of cabinetry and countertop samples, envisioning multiple possible looks to their new space! 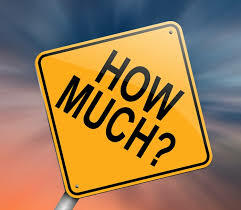 A subject that often comes up in this exploratory stage is the “cost”. The abundant remodeling shows on TV continue to mislead clients to a certain degree about the real cost of materials needed for their projects. In an effort to educate people that come in our showroom, we developed two “informational boards” for people to consider when they are in this stage. The moral to the story: It always comes down to the materials the client selects. The same overall design can result in a multitude of estimates based on the personal preferences of the client. 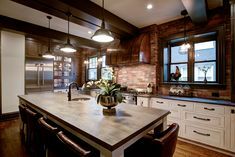 Good Grade Cabinetry to Supreme Furniture-Like Cabinetry, Standard Granite to Exotic Stones… deciding on what you want to invest in requires understanding the options. There are three main stages of remodeling your kitchen. The Design Process usually involves an initial appointment with one of AKB’s designers in your home. The opportunity to view your space and ask questions about your needs and desires for your room is critical before pen ever hits paper. The second appointment is in our showroom where general sketches or computer design drawings will be presented. 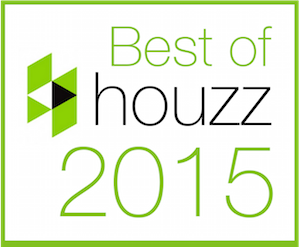 You will be able to view showroom displays and consider cabinet styles, woods and finishes. You may also view and discuss our substantial collection of countertop surfaces, plumbing, and other finish selections. An estimate will be given based on your general information and feedback. 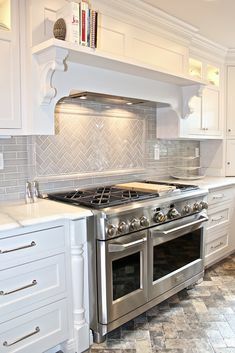 At the end of this appointment, if you feel AKB is on the right path for your cabinetry design, a 10% retainer based on the estimated costs is required. (This amount is applied to the contract.) Once retained, we will continue to refine and modify your design and pricing until you are completely satisfied. When you are ready to begin the ordering process, a 50% deposit on the total contract is required. Obtaining a Contractor can be a confusing process as there are a lot of options. AKB is happy to refer several qualified contractors that specialize in kitchen and bath remodels for you to consider. We work with both large and small companies and are happy to consult with your contractor to ensure the implementation of the design you want. Coordination and Installation is where it all comes together and should be a well orchestrated event! Once we have received delivery dates for your cabinets, we coordinate with you and your contractor to set up delivery to your home. When your cabinet order comes in, the next 40% of your contract is due to AKB. Installation by our installer or your contractor will be followed by countertop field measurements. Countertops are generally delivered and installed within 2-3 weeks of the template date. Once your kitchen or bathroom is completely finished, the final 10% of the AKB contract is due. At this point, AKB will thank you for allowing us to be a part of your project and hope you will allow us to take some photographs of your beautiful new space for our portfolio! Think beyond the social networking site and more in line with your own home. Are you Boldly Geometric? Authentically English? A Collector of Provocative Art? Farmhouse Friendly? Unapologetically Vintage? Eclectic or Timeless? Is your spouse very tall?… while the other is very small? Are your pets kept in their place?… or do they rule the roost? 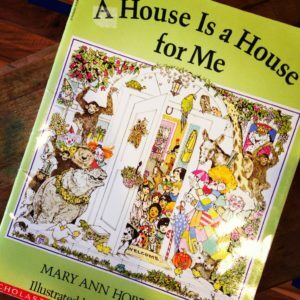 Busy active children?… or empty nesters? Want low maintenance?… or that “look” at all costs? We hear these sentiments often and have helped many people remodel to accommodate their changing needs and lifestyles. 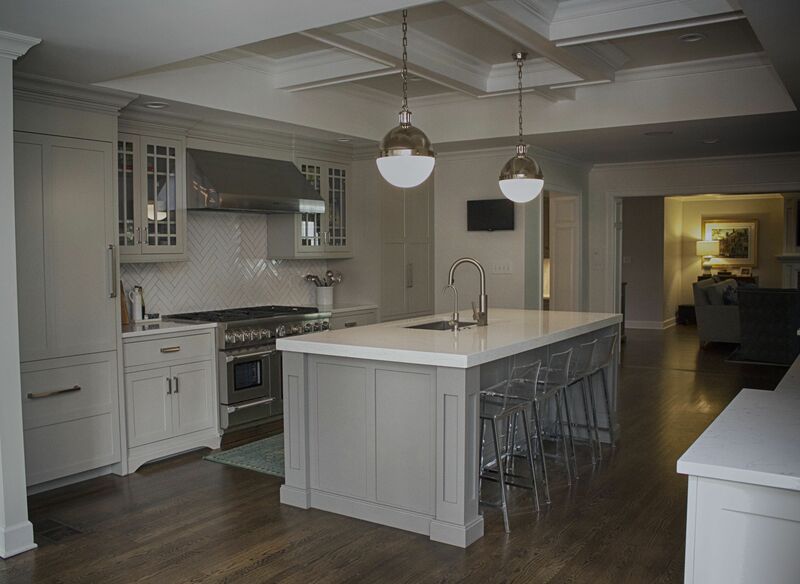 Customizing Kitchens where things are easily reached, avoiding hardware that is difficult for arthritic hands, selecting floor materials that offer smooth transitions and researching technological options for Smart Homes are just a few of the details that come into play. We had a client that came to us after an accident that left her feeling fragile. She wanted to start with her bathroom and needed us to come up with a plan that would make her feel more confident living by herself. The son said, “Seriously, she’ll grab anything that is in her path if she feels unstable!” No one would have ever guessed that the tissue holder, three towel bars, tub faucet and soap tray all strategically placed could each hold up to 500lbs. In this day and age, no need to bolt up the industrial grab bars everywhere. ADA compliant products can be “hidden in plain sight” in many rooms of your home to create safe, yet aesthetically beautiful spaces designed specifically for you. A recent home show episode interviewed the homeowners during their kitchen renovation. 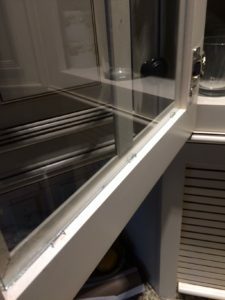 Congratulating themselves on selecting the hand-crafted option over the more well known cabinet manufacturer, they proudly led the tour of their installed raw wood kitchen cabinetry, visibly anxious to begin the next phase of painting them. Shaking my head, I had to change the channel. Hand-crafted is one of those words people feel must be a positive and must mean quality. Not so fast. In our industry, we see hand-crafted projects up close and personal… when we are ripping them out. Give me the furniture grade stuff over the quaint hand-crafted version any day. I want quality hardwood, not even a hint of prefinished foreign plywood. I want hardwood that is dried in a kiln to a one digit percentage moisture content. I want engineering that shows no short cuts and deficiencies. 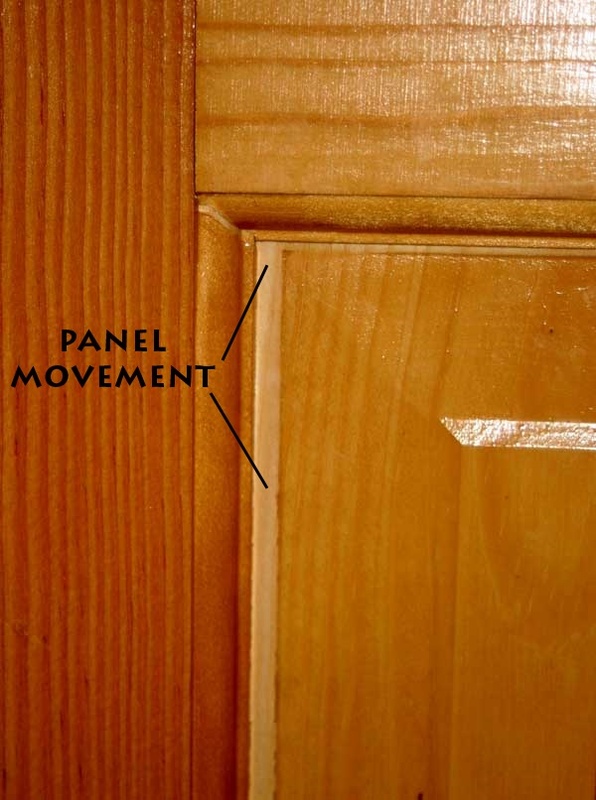 (Look inside a hand-crafted project and see if all the wood grains are going in the correct direction. Did they short cut any thing else?) 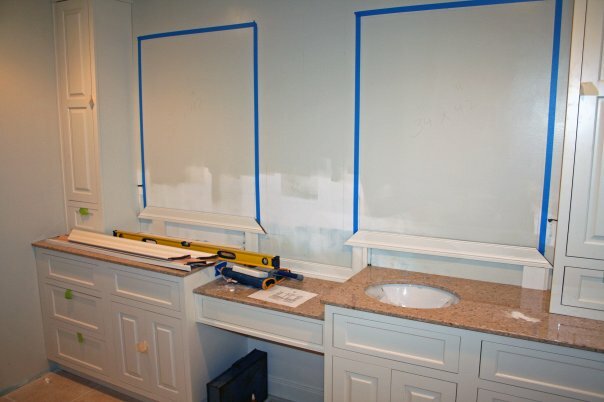 A kitchen client complained that her hand-crafted bathroom vanity panels would free float and show areas on the edges that were unfinished during seasonal changes (see image example below). AKB could have offered her an option made by one of those well known cabinet manufacturer‘s (Mouser Cabinetry) that is constructed, primed and finished so that never happens. Paint? Go ahead, paint the cabinets in your first house, your rental property, paint flowers on your daughter’s vanity in her pink and purple bathroom… paint new cabinetry? There is a reason they don’t paint new cars and boats anymore. Paint is an inferior product. Not sure what warranty you get on the finish of the hand-crafted option, but manufacturers using the lovely Sherwin Williams product can only offer a 2 year warranty on their painted finish. If I am going through the investment of a new kitchen, sign me up for the superman version- a catalyzed conversion process. Chemical Bonding, Catalyzing, Sanding, Sealing, Curing, Finishing in a lovely Dust Proof Room…whatever any of that really means, I’ll forgo being quaint, I just want the guarantee. 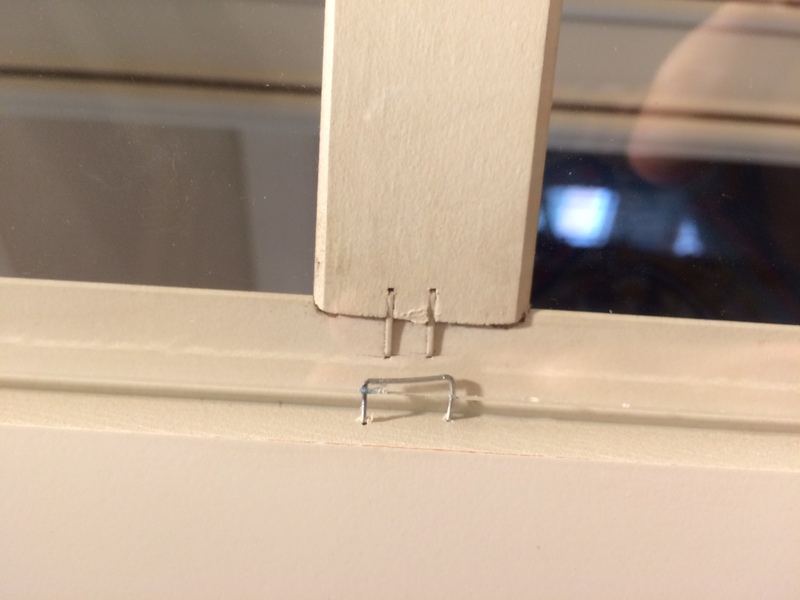 News flash: You will encounter issues when you remodel. The good news is if you hired the right team, you’ll never really know! Pieces and parts do not fit seamlessly into new spaces. Custom cabinetry and professional installers can make sure that you get a beautiful, professional finished look without really stressing about how your walls weren’t exactly plumb. 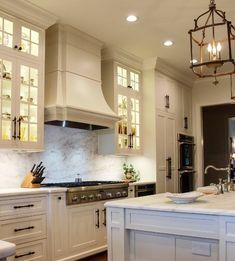 For example, think cabinetry to the ceiling. This offers a continuous look that adds visual “height”. But is your ceiling at least close to being level and flat? 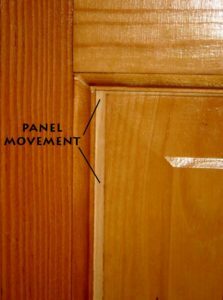 If it isn’t, it requires professional carpentry skills to alter the crown molding to fit the imperfect ceiling and timing of the installation of the cabinetry below. Professional teams working fluidly together will accomplish this task without alarming the clients. At AKB, we believe that every client deserves not to be bothered with that sort of detail. Sort of like… when I go to the dealership to get my auto serviced, I don’t want to hear how you had trouble reaching the cabin air filter, just fix it. I toured a luxury condo development with my mother-in-law today. “Now this one has all the bells and whistles…” said the property manager after we sashayed through one of the more expensive options. “What does that mean exactly?” MIL inquired. “This unit is all custom cabinetry and woodwork. Custom as in Mercedes-Benz quality.” Not letting on to my occupation, I enjoyed her appreciation immensely. Years ago, I conducted a class for a local group of realtors about assessing the actual value of any kitchen in a property they were marketing. It was a basic class designed to help them appreciate the “work triangle” and evaluating quality cabinetry. It was refreshing to hear my own thoughts out of someone else’s mouth.